Just like the people who created the brand in 1980, the owner of a Le Voyageur is a perfectionist, is passionate and has high standards. Like them, he will always be a pioneer, choosing to stay ahead of the pack no matter what the era. In terms of design, technology, comfort and safety, Le Voyageur has made and will continue to make the exception the rule. In 1980, Georges Sacier, a former baker turned haulier, visited the United States where he discovered motorhomes for the first time. His trip became the first chapter in the story of Le Voyageur motorhomes. In the early 80s, Georges Sacier was inspired to combine Duralinox and polyester to create particularly strong motorhome bodywork. This is how the first French A-class motorhome was designed and manufactured on a Mercedes Benz chassis with an overlapping roof and Duralinox frame. Le Voyageur 600 was born. This initial success gave the Le Voyageur brand a sturdy reputation which was confirmed with the launch of six new models over an eight year period. Brilliantly innovative and refined, Le Voyageur became the brand known for its centralised control system, hand-sewn upholstery, and its avant-garde bodywork. 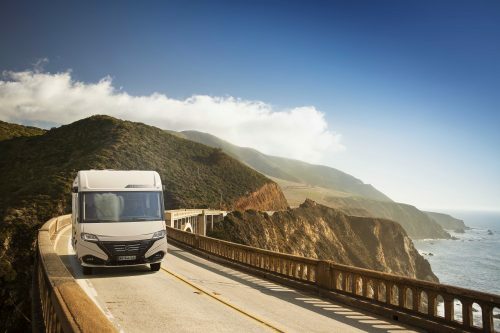 In 2000, Le Voyageur joined Pilote, Europe’s leading group in terms of motorhomes. Two years later, the new production facility in La Membrolle-sur-Longuenée was inaugurated and witnessed the launch of the famous HOMEUR in 2008. Still today, the Le Voyageur brand continues to prove its excellence and, in keeping with its new identity and vehicle concept, is committed to modernity while staying loyal to its values.